These elegant cassolette-form vases with concealed candle sockets were conceived in the neoclassical taste, popularized by designers such as Robert Adam and James Wyatt. 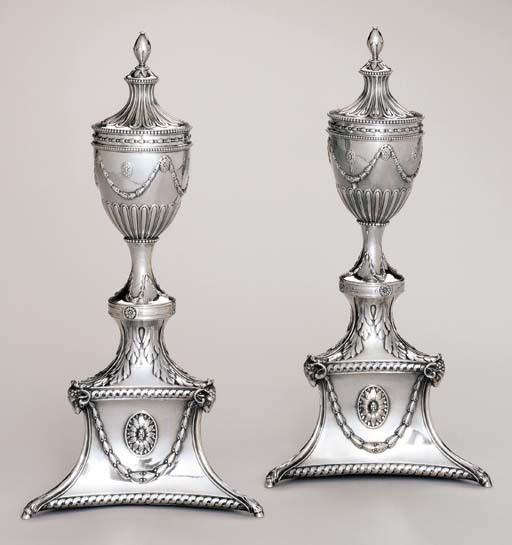 Both Adam and Wyatt supplied designs to leading silversmiths such as Boulton and Fothergill, John Carter and Wakelin and Taylor, who were, in turn, adept at simplifying and adapting their designs. The present lot bears considerable resemblance to a tripod-form silver cassolette, or perfume burner, manufactured in 1779 by Matthew Boulton and John Fothergill now in the Temple Newsam Collection. It has been shown that this cassolette relates, albeit with numerous alterations, to a James Wyatt design for a jug and stand, which was copied into the Matthew Boulton pattern book (see James Lomax, British Silver at Temple Newsam and Lotherton Hall, 1992, p.101-04 and Frances Fergusson "Wyatt Silver" Burlington Magazine, December 1974, pp. 751-55). Like the cassolette, these candlesticks share similar vase-shaped bowls with paterae positioned at staggered heights. These novel candlesticks also share similarities to candlesticks designed in 1773 by Robert Adam for Sir Watkin Williams-Wynn. John Carter executed the Adam design in silver in 1774 and both the candlesticks and Adam's drawing are illustrated in Robert Rowe, Adam Silver, 1953, figs. 12 and 13. While considerably simplified in design, they share with the present lot a similar vase-form bowl, ram's heads and bellflower swags. It is interesting to note that the present lot was manufactured by John Carter's younger brother or cousin, Richard Carter in partnership with Robert Makepeace, and that their partnership was recorded the same day in which John Carter was noted as leaving the trade.